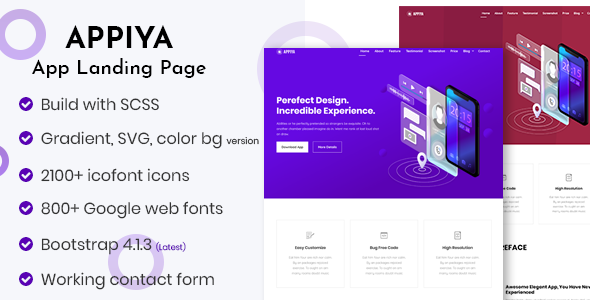 APPIYA is a professional HTML5 App landing page template for any kind of Apps, Software or any kind of digital product marketing website. It’s made with the latest version Bootstrap framework, SCSS preprocessor. APPIYA is responsive for all of the devices and designed with a clean look and feel, stylish & modern trend. For makeing the feel and look of awesome we used many awesome CSS3 animations. It comes with 10 unique HTML pages which include tons of sections, 1 homepage, 5 blog layout pages, 3 single and blog pages and a 404 page. APPIYA has 6 different pre-made gradient background, 6 different SVG backgrounds, and 6 different flat background color schemes. Also, you can add unlimited gradient, SVG or color scheme very easily. 2100+ icon fonts by IcoFont 800+ Google web fonts can give you huge benefits to select font-icons and web fonts. To make a professional looking Apps, Software or any kind of digital product landingpage with minimum cost, APPIYA can be your best choice.